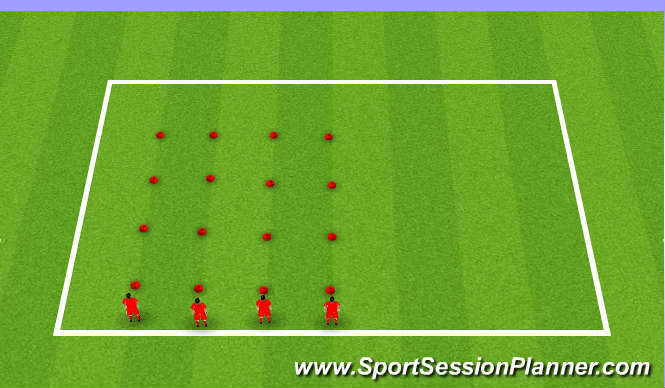 To begin with players complete 3 sets of 5 Jumps (focus on landing in athletic stance, pause and controlled landing). Players then take two jumps with the second jump focusing on a soft landing in a glute dominant squatting position holding for 3 seconds. (3 sets x 5 reps). Single leg jumps - Players should land with hip, knee, and ankle in neutral position. Athlete should look for good hang time not necessarily jumping for distance or height, but hang time. (3 sets x 5 reps per leg). Hop, Hop single leg landing- Players should land with hip, knee, and ankle in neutral position. (3 sets x 5 reps per leg). Single leg lateral jumps - Start on one leg and bound laterally, landing on the opposing foot. Athlete should land with hip, knee, and ankle in neutral position (3 sets of 10 reps). 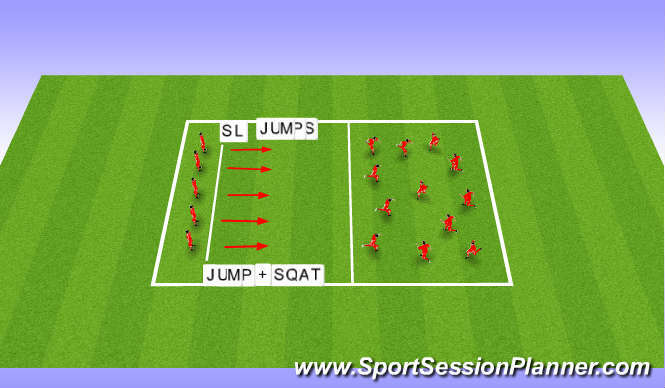 To finish with have players run around grid then on command perform the named jump (e.g jump into squat, single leg hop into single leg landing) with emphasis on soft knees on landing.